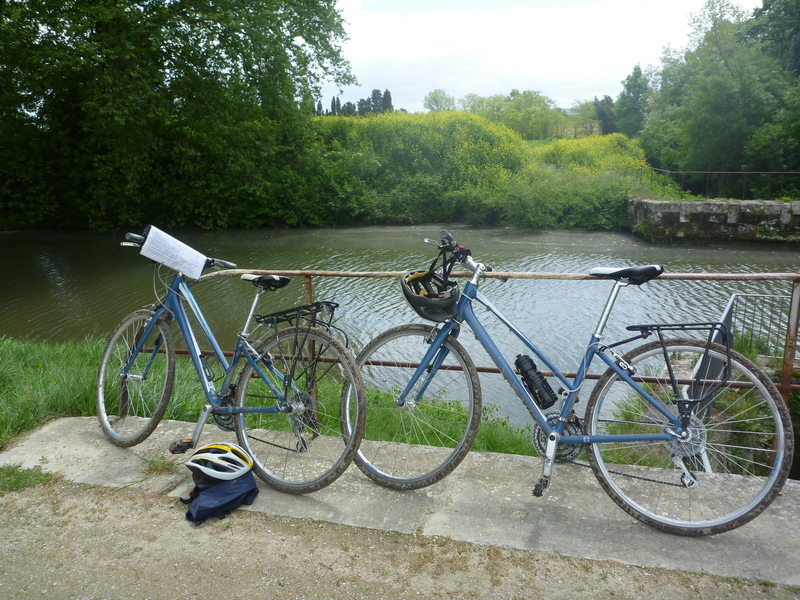 Cycling along the Canal du Midi. Being a confirmed Francophile I jumped at the chance to go on our newly introduced cycling trip along the Canal du Midi. Following in the boat trails of Rick Stein in a region rich in history with the chance to sample delicious food alongside the obligatory glass of local wine is right up my street! After an early morning flight from the North of England to Carcassonne, we took a transfer from the airport to our first stop Castelnaudary, the home of the delicious Cassoulet. We were kitted out with our bikes and chatted through how the next few days were going to pan out with the very knowledgeable lady Fleur, from our local supplier. The rest of the day was ours to do as we wished which we filled by taking a stroll around the town, gathering our picnic for the next day and discovering a fabulous balcony view of the town. Dinner that evening (included) was at a local restaurant just a short walk from the hotel, aptly named ‘Maison du Cassoulet’. Yes I did try the local speciality and very tasty it was too! The next day dawned and thankfully the rain had stopped, so, after a delicious breakfast we left our luggage at reception ready to be collected and whisked away to our next hotel. We were so eager to jump into the saddle for our 40 odd kilometres cycle to Carcassonne. Leaving Castelnaudary behind we passed the Grand Bassin (the largest body of water along the Canal) and arrived at St Roch locks the first of the many locks we would come across along our journey. Although it was only April there were already boats waiting to enter and exit the locks being deftly dealt with by the lock keepers. In France locks either have a lock keeper or are automatically operated. A fair number of them have a little shop or bar (all are highlighted in our route notes) so you can sit and watch whilst enjoying a well-earned refreshing drink or ice cream. Next we arrived at Bram Port and here the route notes gave us the opportunity to take a small detour to have a look around the town of Bram or Eburomagus, originally a Roman town dating back as far as 60BC. We chose to do this and despite the wind trying its best to hold us back, we had a pleasant wander around (there are a number of shops here if you want to bolster your picnic but do beware of lunchtime, bank holiday and Sunday afternoon/Monday closing). We had a quick chat with the locals in the bakery before getting back in the saddle again and returning to pick up the route towards Caux-et-Sauzens, a site of iron working also dating back to Roman times. The sun came out and the wind dropped a little so we took time for a bite to eat next to a little stone bridge. This didn’t last for long however and so we decided not to take the small detour suggested in our route notes to Caux-et-Sauzens but to continue along our route to majestic Carcassonne. After easily negotiating the outskirts of the town, we arrived at the Pont Vieux straggling the River Aude. Crossing this river provides some simply stunning views of the UNESCO World Heritage ‘La Cite’ and left us just a short distance from our chosen Hotel de l’Octroi. We arrived at the Hotel mud splattered but dry and despite this, received a very friendly welcome. After a lovely warm shower and change of clothes we took an early evening stroll which led us to within the walls of the Citadel (just 5 minutes or so on foot from the hotel) and of course then finished the day off very nicely with another tasty meal. After a good night’s sleep and another fuelling breakfast we got on our bikes again for our cycle along the canal into the Minervois wine region and onwards to Homps. We returned to the Pont Vieux, taking some final photos of the imposing Citadel before buying some picnic supplies. We rejoined the canal on the other side of town back in the tranquil surroundings, only broken by boats, locks, birdsong and other cyclists! Our first stop en route today was Trebes, great for a refreshing drink before continuing on into Minervois wine country. After arriving at a decision point labelled in our notes as Marseillete Bridge, we took the suggested detour to Capendu. 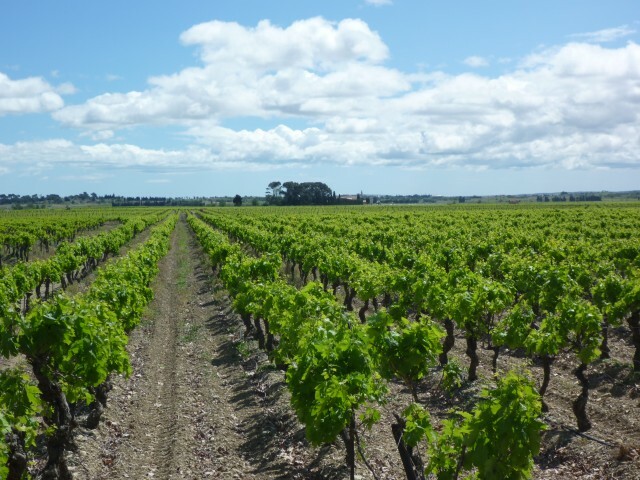 The Chateau de Capendu houses the local wine producer and some of the detour takes you past the endless lines of the vines which will in turn make the local Corbieres and Vin de Pays d’Oc wines. We arrived at a pretty little square, the perfect place to lock up our bikes, sit on the well placed benches and eat our picnic to the sound of trickling water in the fountain (rather oddly it seemed to be frothing and smelled of washing up liquid, but that might just have been me!). After wandering around the mediaeval streets we made our way back to the bridge to continue our route. You really do know you are in wine country now, the views open out to row upon row of vines. There are a few opportunities to enjoy some wine tasting on this section if you wish. We continued on arriving in canal side Homps to be met by Nina the warm and friendly ‘patronne’ at the delightfully quirky Le Jardin d’Homps, our stop for the evening. Unfortunately, although the swimming pool looked very inviting it just wasn’t quite warm enough to make a splash! Today’s journey was the longest cycle at 62kms. After breakfast and once again leaving our luggage for collection in the entrance hall, we headed to collect our supply of water and began the day’s adventure. Travel is through lots of towns and villages mostly alongside the canal today with my personal favourite being Le Somail. I highly recommend crossing the pretty stone bridge to see if the Epicerie on the boat is still there! Onward to Capestang Port and by now, with 42kms under our belts, we felt a rest and some sustenance was in order. We didn’t head into the town but you can make use of the picnic benches just past the port. The final 20km stretch today took us above the Malpas tunnel (the Centre Touristique et Culturel has cold drinks and toilets should you feel the need) and to the marvel of the Fonserannes locks (I’d recently been to Fort Augustus near Inverness in Scotland and could definitely see the similarities in scale). The views over to Beziers with its imposing Cathedral, clearly the centre piece are stunning. Don’t be fooled at this point as there is still quite a distance to go before you get to the centre and your Hotel. We made it, tired, thirsty and definitely ready for a shower! Our final day of cycling saw us leaving Beziers behind and heading for the Mediterranean and the end of the Canal at the Etang du Thau. Today we cycled through marshlands. We were fortunate enough to glimpse flocks of flamingos basking in the sunshine (yes it did make another appearance) and wild horses grazing to arrive at the Libron complex. I won’t go into detail here as you really do need to see this feet of engineering for yourselves! What I will say is we were lucky enough to see a boat navigate the complex. We continued and reached the round basin lock, the only one on the Canal, before reaching Agde. Here, you’ll find a lovely park where you can eat a picnic and watch the world go by just to the left before crossing over the road to go into the town. Do take time to have a wander around its narrow winding lanes too. From Agde you head to the countryside again and into the Bagnas Nature Reserve, the route notes explain there are many bird species available to spot here. Eventually we reached a bridge where we could literally see the end of the Canal and the ‘Etang de Thau’ not too far away in the distance. We decided to make the extra 4km round trip to Port des Onglous so we could take photos and prove to our colleagues back in the office that we had really done it all! The next and final stretch of the route became quite windy and took us past sand dunes with intermittent views of the Mediterranean Sea. We had a welcome ice-cream stop at Camping Castelas to give us the energy for the last few kilometres into Sete but didn’t dip our toes as it still looked a little cold even for a couple of ‘Northerners’. We arrived at the promenade in Sete and foolishly thought we were very close to leaving our bikes behind but there was still a number of kilometres to do before arriving at the Canal du Sete and the welcoming ‘Grand Hotel’ our final stop. We cycled a total of 206km, slightly more than the route notes stated as we made a few extra detours of our own! We weren’t sad to see the back of our trusty ‘giant’ steads mainly due to the saddle soreness we felt from their seats! Overall what a fantastic few days of cycling in such a lovely part of France. The terrain on this holiday is quite bumpy for the most part on earthen, clay, cinder, stony paths and tracks so be prepared to not get the kilometres under your belt as quickly as you might on tarmac. If you don’t fancy the long days, why not choose to take the train to cut short the 2 longest days and make more of the time in Beziers and Sete? We ended our French adventure on a much more relaxed note with a rail journey back the way we had cycled to Toulouse, staying overnight at the perfectly situated Hotel Pere Leon in ‘la Ville Rose’, people watching in the Place du Capitole, sipping chilled white wine and reminiscing about the last few days. Perfect! Tina James is the managing director at Headwater and she enjoys contributing to the company blog about her adventures. Tina loves to relax, but is also partial to walking and cycling through the British countryside.